Keeping secrets is never easy, especially when you have potentially thousands of people doing their best to prematurely uncover them. Take Call of Duty: WWII, for example, which has millions of fans eagerly awaiting its arrival later this year. With such a large player base to contend with, it’s inevitable that some of them will go digging in the right place at the right time. That couldn’t be truer than it is today, as a recent leak (via Bloody-Disgusting) has outed the shooter’s Zombies mode ahead of schedule. Developer Sledgehammer Games will no doubt be miffed by the leak, but what perhaps makes this particular discovery sting just that little bit more is the date pegged to its official announcement. 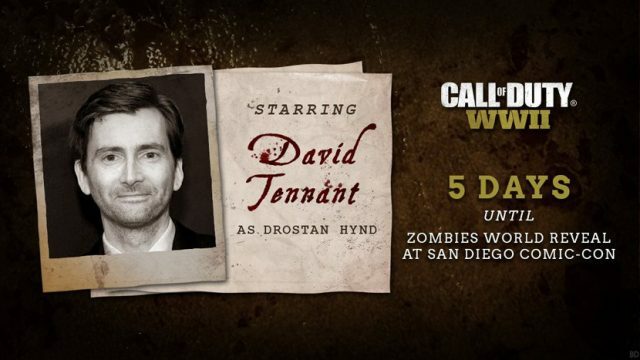 As it turns out, the undead-slaying mode was due to be revealed at San Diego Comic-Con later this week, with promotional material counting down the days until its unveiling, one of which you can see for yourselves below. Oh, and it also features a very familiar face for all those Doctor Who fans out there, too. Along with the above, a trailer was posted to YouTube, although this appears to have since been taken down. A mirror has surfaced online, however, which you can view at your own discretion here. Having given it a once-over myself, what jumps out at me immediately – besides the bloodied corpses and eerie voiceover – is just how dark everything looks thematically. Even going back to its initial debut in Call of Duty: World at War, Treyarch and Infinity Ward have always utilized the cooperative mode as a vehicle for wacky comedy and homages, even going so far as to include guest appearances from genre veterans. Sledgehammer, it seems, is going in a new direction this time around. Army of the Dead, as it appears to be called, looks considerably more gruesome than what’s come before. But it’s still early days yet. Call of Duty: WWII is out November 3 for Xbox One, PlayStation 4 and PC, so there’s still plenty of time for the developer to pull some surprises out of the bag. Assuming it can keep them in there, of course.